We would like to say a huge thank you to everyone that has raised money for our school over the years; it has helped us immensely & has provided us with opportunities to purchase equipment, resources & outdoor play apparatus for our children. Any amount raised is greatly appreciated by Ridgeway School & will make a huge difference to the education of our children. If anybody has any fundraising ideas for us then we would love to hear them! Ridgeway School have signed up to easyfundraising! Did you know that whenever you buy anything online - From your weekly shop to your annual holiday - You could be collecting free donations for Ridgeway School - Warwick? 1. Head to https://www.easyfundraising.org.uk/causes/ridgewayschool/ and join for free. There are over 3,000 shops and sites on board ready to make a donation; including Amazon, npower Tesco, Argos and eBay – It doesn't cost you a penny extra! 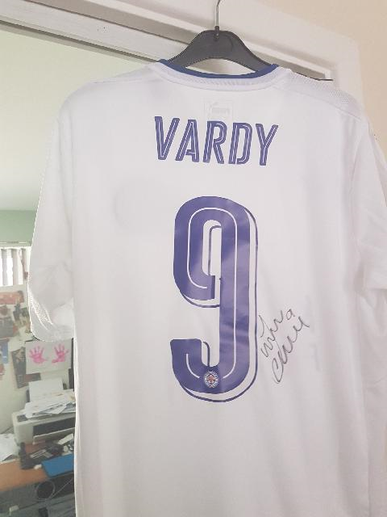 A huge thank you to Gordon Dando for raising a fantastic £270 for us by auctioning off a Leicester City shirt & Captain's arm band; as signed by Jamie Vardy. This money will go a long way to help us purchase resources for our pupils & we are incredibly humbled that Gordon chose to raise money for our school.